My mother was a cook, not a baker. She liked to mix things at will, go at her own pace, create her own masterpiece. Baking was too rigid for her, especially since she didn’t have a sweet tooth. However, I had a sweet tooth so once in awhile when the mood struck her or a cold struck me, she’d make Æbleskiver or literally, apple slices despite the fact they never had apple in them! They’re simple little cream puffs that are easy to make and even easier to eat. In 2005 I learned that I could no longer eat gluten which meant no more cream puffs. Take away my rye bread, my croissants, even my chocolate cake but not the Æbleskiver! 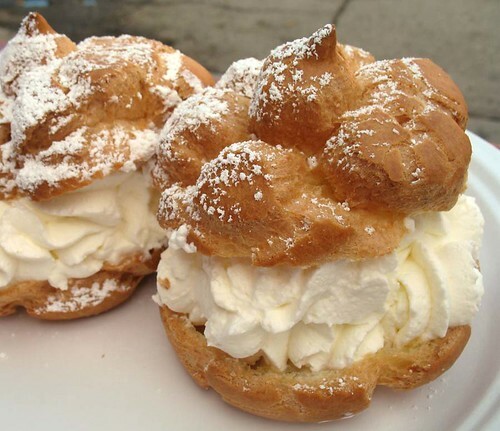 So imagine my delight when tonight the wonderful girls that are the Celiac Chicks posted an easy, wonderful recipe for, what else, gluten-free cream puffs! With cream filling and chocolate glaze no less! Danes are fairly conservative when it comes to food, appreciating traditional cooking, and often hesitating to embrace new “different” types of food. This is me completely which is why when I had to give up my puffs, I could find nothing else. But now, there’s a choice. The choice of cream, or sauce, or jam inside? Or glaze or sugar on the outside? And those are changes I can live with. Thanks for the recipe for glutenfree cream puffs. I will try to make them in the coming weekend, when friends come over. My son and me also have to eat glutenfree and I’m always happy to find a new recipe so I can make something delicous.